Ultrasound is the standard screening modality for fetal imaging. 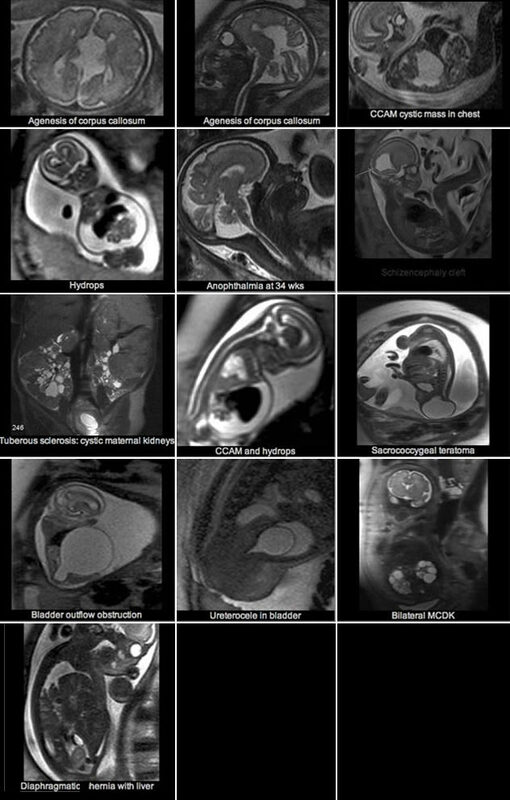 However, fetal MRI is increasingly being used to add further information regarding fetal anatomy and pathology. This improved clarity of information achieved with fetal MRI facilitates optimal prenatal counselling. MRI frequently provides additional information over what has been achieved with ultrasound alone. To improve our prenatal diagnostic capability and diagnostic confidence, MRI is now recommended for many fetal conditions. Because MRI uses magnetic waves and not x-rays (ionizing radiation), it has been shown to be safe to use in pregnancy. As the fetus’ organs are undergoing rapid development in the first trimester, MRI is avoided until after the first trimester. There are no known harmful biological risks from clinical MRI. Recent technological advances in MRI have meant that scan times are now very fast. In fact, one image is acquired in less than half a second. This means that sedating or anaesthetizing the fetus is no longer required to achieve a diagnostic study in almost all cases. The patient shall be positioned lying on her back in the supine position and up on her side in the third trimester. Sometimes patients may be claustrophobic, and this can usually be overcome with a mild sedative. A patient will often be asked to hold her breath for 18-20 seconds or sometimes is left to do quiet free breathing. The entire examination usually takes 20-25 minutes. MRI can give us additional information in evaluating the central nervous system in the same way it does when used in the newborn baby, infant, child, adult or elderly person. MRI gives superior soft tissue contrast in a variety of different imaging planes or angles through the part being examined. This often can confirm if a structure is normal or abnormal and can help clarify structures that are not clearly seen on ultrasound. When congenital diaphragmatic hernia (CDH) is evaluated with ultrasound, it is often difficult to be sure whether or not the liver has herniated up into the chest. Fetal MRI can better evaluate for the crucial prognostic signs of diaphragmatic hernia (liver in the chest) and lung volume to determine if lungs are small (hypoplastic). With lung masses, MRI can help to differentiate between cystic adenomatoid malformation and bronchopulmonary sequestration and congenital diaphragmatic hernia. When a fetus has a giant neck mass, there is a chance that the mass may be pressing the trachea or windpipe. At birth this can mean that when it is time to breathe, the mass is suffocating the newborn baby. Fetal MRI can help identify those babies with potential airway obstruction. This can help facilitate a specific form of delivery only performed in a major hospital, called an EXIT procedure. EXIT (ex-utero intrapartum treatment) is a procedure where the mother undergoes a general anaesthetic and the baby’s head is delivered. The rest of the baby stays inside the uterus and the feto-placenta circulation is maintained. This allows the paediatrician more time to try and pass a breathing tube down the baby’s airway and prevent the mass from suffocating the newborn. 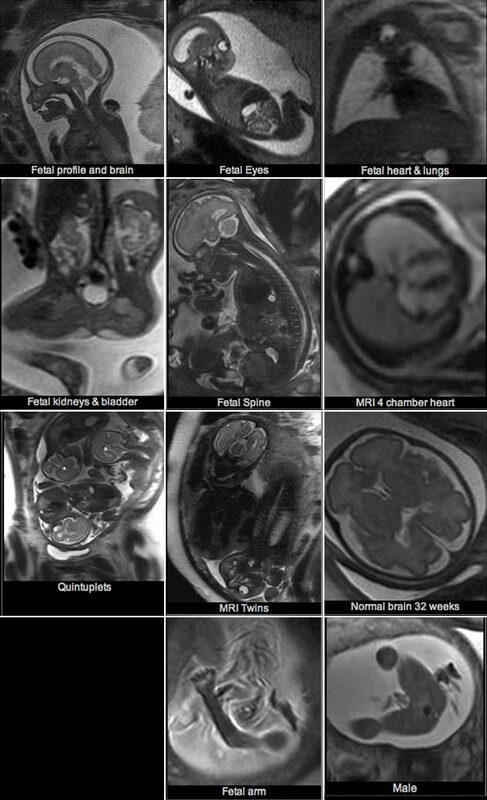 Fetal MRI can make a valuable contribution to in counselling, patient decision making and pregnancy management.